What is the Junior Citizen Scheme? 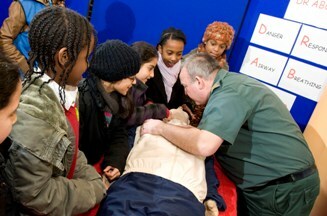 The Junior Citizen Scheme is aimed at Year Six children (10–11 year olds) attending primary schools throughout London. Coordinated by the Metropolitan Police Service or the London Fire Brigade, the events are supported by a large and diverse selection of agencies, including us. Each child is taken through a number of practical scenarios that highlight hazardous situations they may encounter in their everyday lives. Sessions lasts only 10 minutes, within which experts deliver a number of safety messages in a fun and entertaining way to ensure maximum impact and retention. During our session we ask each child to imagine finding someone unconscious. We give advice on what actions are appropriate, with particular emphasis on personal safety. A mock 999 call may be made by one of the children and a volunteer may be asked to demonstrate the recovery position. For more details about the Junior Citizen Scheme please call us on 020 3069 0383 or email us using the link below.